NOT A STAND-ALONE GAME. At least one copy of the Memoir '44 base game and many of its expansions are required to enjoy most of the included scenarios. We highly recommend that, for visual accuracy, players at minimum own the Terrain Pack and the Winter/Desert board. 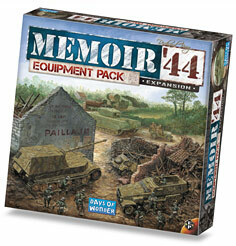 Welcome to the Memoir '44 Equipment Pack, the largest set of figures ever released for Memoir '44. On D-Day, the Allied forces unleashed over 150,000 men and thousands of tons of equipment along the coast of Normandy. 68 years later Days of Wonder has introduced this major expansion to the Memoir '44 game system which fills a game box as big as the original board game and includes 186 plastic figures. These figures can be deployed over many of the existing Memoir '44 scenarios and are also heavily featured in the 11 Standard, 2 Breakthrough and 4 Overlord new scenarios that come in the Equipment Pack. A Rules booklet and 25 Summary cards complement this pack. World War II spurred the most frantic period of weapons development in the history of humanity. Countless new designs and concepts were fielded in the most diverse Theaters of Operations, often with great success. Mastering them made all the difference between battles won and lost.